This isn't your average barbecue spot. In the past few years, Lowest Greenville has been a neighborhood of constant change. Openings and closings seem to be announced on a monthly basis as the area adapts to challenges and demands among the crowds that haunt this stretch of road. Greenville’s latest arrival is bringing traditional Texas barbecue with a few interesting and important variations. Louie King BBQ has planted itself at 1916 Greenville Ave., toward the lower end of the strip in the former Daddy Jack’s space. The pits are under the care and attention of Will Fleischman, the man who first made a name for himself by churning out excellent ‘cue at Lockhart Smokehouse in Bishop Arts. He left that restaurant a few years ago, and his resurrection at a new joint should be enough to pique the interest of most barbecue fans in the city. This go-round, Fleischman has decided to shake things up a bit with the menu. Any barbecue junkie knows the menus at most barbecue restaurants show little variation from place to place. Brisket, ribs, sausage, etc. and the standard sides. 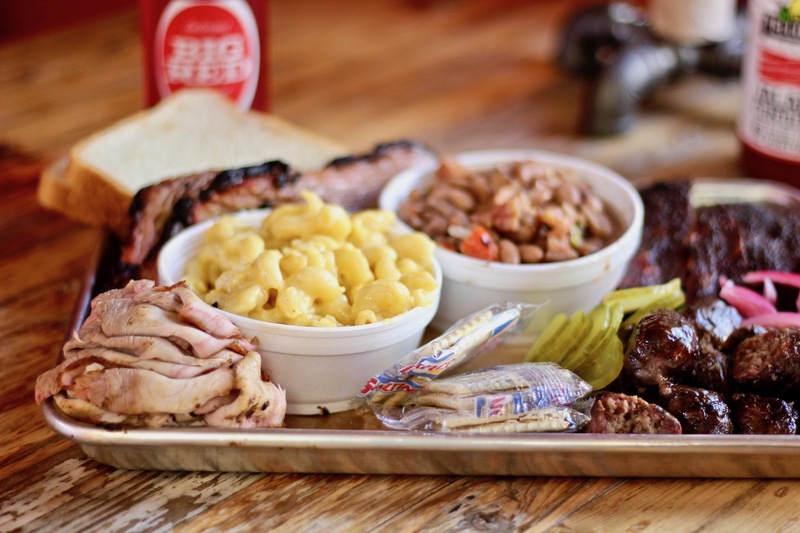 It’s what people come to expect from Texas barbecue, and there’s nothing wrong with that. But the folks at Louie King throw in a few interesting items that you won’t see anywhere else, really. Take their smoked and sliced pork loin. It’s a fresh and welcome alternative to the standard pulled pork. The loin is lean and sliced thin. It’s piled on the tray like a ball of soft, meaty ribbons. It’s good stuff and perfect between two slices of bread. One of the most intriguing inclusions on the menu is their exceptional Pittsburg hot links. No, we’re not talking about a Pennsylvania-style sausage, whatever that might be. This is Pittsburg, Texas, an East Texas town a little south of Mt. Pleasant. Here, they specialize in a rare breed of tubed meat. These beef links have a softer texture with a deep, richer, almost earthy flavor. They lack the traditional snappy casing you’d find with traditional Texas sausage. They’re almost squishy. But they’re quite enjoyable. They’re traditionally served on saltines with hot sauce, and that’s exactly how they’re presented at Louie King. Of course, Fleischman brings his skilled hand to churn out some excellent brisket. It’s soft, smoky, and well-seasoned. His pork spare ribs are no less successful. Sticky, slightly sweet, and tender. You’ll want to nab some of the sensational charro beans. They’re studded with lovely bits of pork, peppers, and onion and they’re one of the best mouthfuls of beans you’ll find anywhere in this town. We should not overlook the selection of sauces. They do a more traditional red sauce that’s spiked with a touch of bourbon, giving it a slightly sweet flavor. But I was particularly fond of the Alabama white sauce. It’s got Duke’s mayo at its base, but it’s thinned out and seasoned with herbs. I couldn’t keep away from the bewitching concoction. Louie King delivers where it matters most, and it’s got what it takes to earn some attention in a competitive barbecue market. At the same time, it doesn’t take itself too seriously. Greenville would do well to embrace this place for many years to come.